We're pretty keen on the recent emergence of Kinect-enabled Xbox Live Arcade games, as only a handful of the existing retail offerings have captivated us long enough to warrant a full-price purchase. We need these kinds of quick-hit experimental offerings, and we need them fast – though the downloadable releases to date have been a little hit or miss. 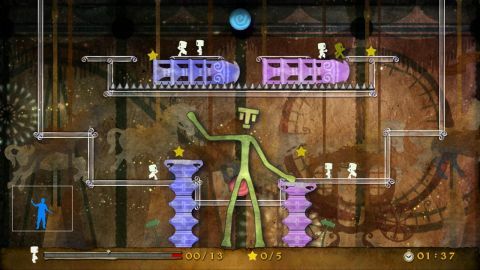 Or rather, hit (Fruit Ninja Kinect) and miss (Hole in the Wall), since only two have launched prior to this week. Leedmees falls somewhere between those two titles in terms of quality, though it's not for a lack of an interesting idea. Konami's original offering puts you in the role of a bridge, as you'll guide creatures towards a goal in each stage by moving your arms, rotating your head, and crouching as necessary. Over the course of 50 solo stages, your stone monolith character – which matches your own physical movements – will create walkways for the little Leedmees, as well as scoop them up, block their automated walking paths, and even lightly fling them towards suspended stars or the goal. Initially, the straightforward level designs and lack of notable obstacles will have you collecting all the optional stars with ease; but as more devious elements like spikes and creature-crushing balls come into play, you may well find yourself simply focusing on getting the required number of Leedmees to the goal. It's not that the later missions are immensely difficult; it's more that we just didn't care enough to strive for much more than the minimum as the game progressed. With an Elebits-like whimsy and a pretty sound idea at the core, Leedmees should be solidly captivating – but it's sadly a bit of a nonstarter. And based on the early footage, we were sure that the dozen additional co-op stages would deliver an engaging same-screen multiplayer experience, but the Kinect can't seem to handle the required actions with any semblance of grace. Something about matching arms with a partner just doesn't smoothly compute here, and it's necessary to properly enjoy these stages, whether you're building a circuit between electric switches or just trying to create one long bridge on the screen. Sadly, those little hitches transform what should have been Leedmees' brightest spot into a frustratingly forgettable option. Konami's slick launch trailer for the game shows a living room full of attractive folks smiling and cheering along to Leedmees; all we got from the game was mild contentedness, punctuated by moments of co-op annoyance. But this sort of inoffensive and undeniably unique bite-sized offering should play well with families, and for the rest of us, we can only hope it's but a stepping stone on the path to richer and equally affordable Kinect experiences on the horizon.